I saw on Annet’s and queenie’s blog this twisted satin being worked on two satin stitches, with different colours and twisted more prominently. I loved them all. Since by then I had completed this sampler, these treatments have to be incorporated elsewhere. 3.Twisted satin stitches are worked over fly stitches in the first row, with wheat ear stitch in the second row and with Italian border stitch in the third row. I tried working this twisted satin as fillings. 4. 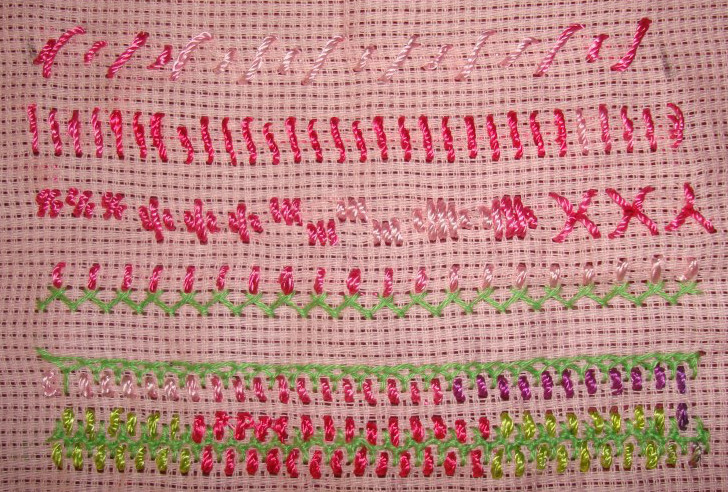 The first sample has twisted satin and Algerian eye stitch, horizontal and vertical twisted satin stitches are worked in the second sample, Twisted satin stitches are angled in the third sample, back stitch diamonds, french knots and twisted satin form the fourth sample, twisted satin with chain stitch is the fifth sample. 5.Twisted satin stitches are worked in two levels with triangular feather stitch in the first row, slanted twisted satin stitches are worked with buttonhole stitch in the second row, and they are worked with zigzag coral stitch in the last row. Twisted satin stitch and its beaded version were announced together on the TAST challenge by SharonB. I first worked on the twisted beaded satin stitch before leaving for India. 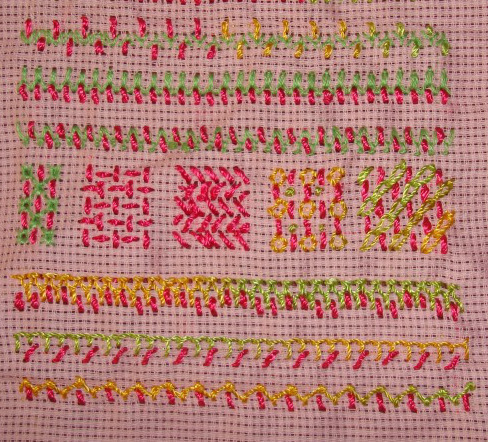 After returning I have started with this stitch. 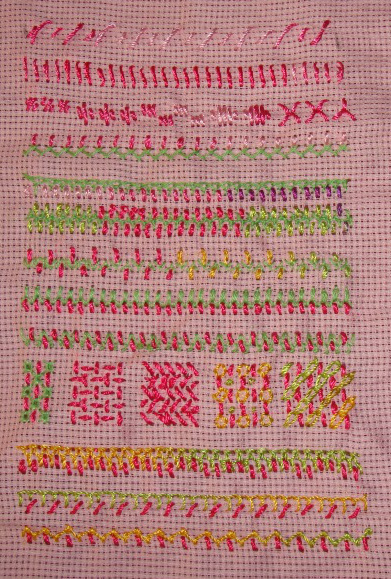 Twisted satin stitch is combined with other stitches in this sampler. 1.Starting with the angled long and short twisted satin stitch in the first row, the twisting threads are either long or shorter than the basic satin stitch in the second row. The third row has variations of twisted satin stitch grouped together.